There are many markets in Aude which offer a chance to sample the French way of life. They normally start around 9am in the morning and finish shortly after midday and are at an easy to find, central point in the village or town. They offer a range of fresh food, hand-made crafts and various other artefacts and treasures such as clothes, jewllery, etc. A large, colourful and busy market with arts and crafts, fresh fruit and vegetables grown locally and other specialist local produce. It can be difficult to park, so arrive early. The cafes around Esperaza squares are a popular place for English and French speakers to socialise. 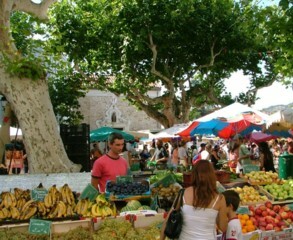 Each Tuesday morning there's a small market in the square, selling mainly local produce. In July and August there is a night market in Limoux, which is a lively affair. A busy market with a large variety of stalls. 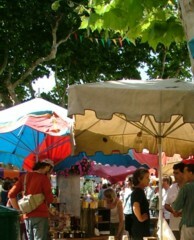 The Limoux market has a good range of local food and crafts and attracts more of a French crowd. 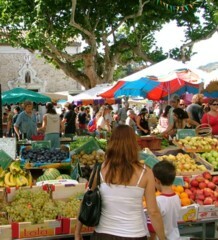 Smaller than Quillan's Wednesday market, a good selection of food, but little else. There are many markets in Aude which offer a chance to sample the French way of life.